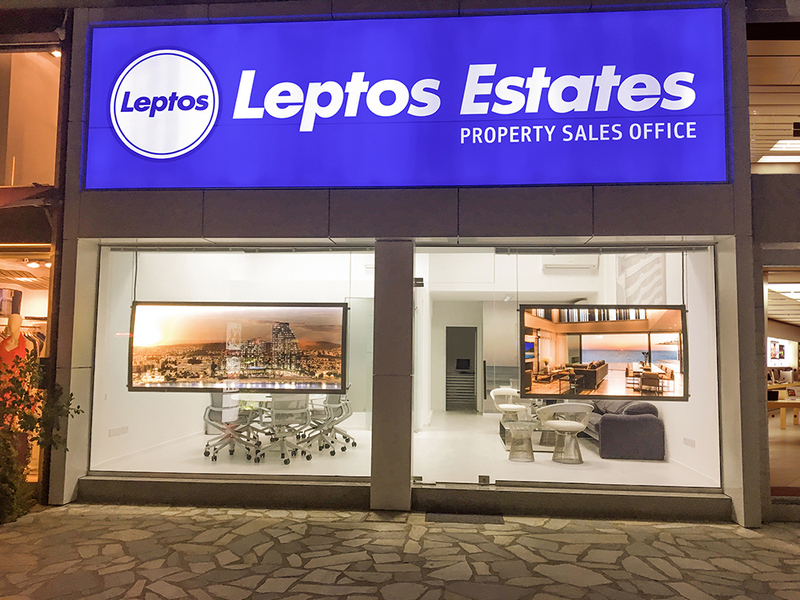 Leptos Estates has recently opened a new sales and marketing office in Limassol, to further capitalize on the great success of the Limassol Del Mar and pave the way to their new exciting developments in the city. The new office is located just across the Four Seasons Hotel and right next to the branch of Russian Commercial Bank - RCB on Amathountos Avenue 104. It will enhance the group’s presence and visibility in Limassol and benefit from a strong demand in the HNWI client segment, looking for a solid lifestyle as well as monetary investment. A thorough interior as well as exterior uplift of the space has given the office a fresh, sun-filled, and roomy feeling that falls in line with the group’s newest design & architectural principles. Furthermore all necessary IT systems and visual aids have been installed for a more productive operation and an enhanced client experience. The experienced staff of Leptos Estates manning the office are fluent in Russian, English & Greek languages and are ready to provide information on the existing as well as upcoming developments of the Group which include the iconic Limassol Del Mar, the upcoming Blue Marine, the Limassol Park, the luxury seafront villas of Adonis & Coral Seas and the gated resort residences of Aphrodite & Venus Gardens in Paphos. The Leptos Group, with over fifty eight years of experience, has an outstanding property portfolio both in Cyprus (Paphos, Limassol, Nicosia), and Greece (Athens, and the islands of Crete, Paros and Santorini). The Leptos quality portfolio is comprised of more than 325 prime projects ranging from spacious apartments, stylish townhouses, luxury villas and elegant seafront properties in exclusive locations. Photo: The new Leptos Estates Sales Office in Limassol.